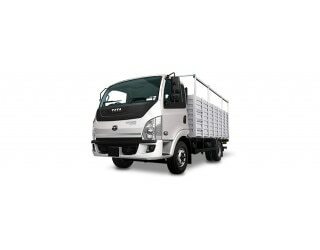 Nov 29, 2018: The Tata Ultra 1014 is a close sibling to the Ultra 1012 and has similar features, barring a few. The engine under the hood makes a maximum power of 136.1 bhp at 3,000 rpm while churning out a peak torque of 360 Nm at 1,400 rpm. The produced power and torque is delivered to the wheels via a 6-speed manual gearbox unit. The day cabin on the body can be titled and has power steering. Despite having a long wheelbase of 4,530 mm, the turning radius is just around 7,600 mm. The stopping power comes from air brakes. Further, the truck is suspended over Parabolic leaf spring for the front and Semi-elliptical for the rear.